Independent testing of a 3D print material manufactured by igus, iglidur I3, has passed a United States inspection that proves the materials’ effectiveness in reducing fire risk within vehicle interiors and thereby improving safety for occupants. The iglidur I3 material is extremely abrasion-resistant and passed a fire test in accordance with Federal Motor Vehicle Safety Standard 302. In the tests, the measured calorific value of iglidur I3 was five times lower than the maximum permissible limit. Experts learned from recent investigations that fires in vehicle interiors are caused primarily due to the careless handling of cigarettes and matches. Materials that have low ignitability and flame propagation speed are required to prevent such fires. Materials that have those components impede combustion and diminish the spread of the flame, giving occupants time to stop and exit the vehicle, even at a high rate of speed. The iglidur I3 SLS powder, a tribo-polymer material created by selective laser sintering, includes those qualities and is frequently used in vehicle interiors. The material has now passed the fire test in accordance with FMVSS 302. The test procedure analyzes the fire resistance of materials used in the passenger compartment of motor vehicles. In the test, a horizontally arranged product, such as a plate, with an average thickness of 2.02 mm, was blasted with a Bunsen burner at a flame height of 38 mm. Experts then determined the propagation speed of the flames. The maximum permissible value is 4 inches/min or 102 mm/min. The iglidur I3 reached an average burn rate of only 18.8 mm/min, far below the test’s maximum value. Besides its fire-resistant qualities, iglidur I3 components are abrasion resistant and readily available. The components achieve high abrasion resistance due to the pressure in the SLS process. In laser sintering, virtually no reworking of the finished parts is necessary, and they can be used directly, in prototyping and in batch production. In laboratory testing at igus, plain bearings made from a 3D print material were compared to bearings manufactured by the selective laser sintering process. In pivoting, rotating and linear motion, the SLS parts were at least three times more abrasion-resistant than the compared materials. In addition, there is no need to store spare parts and tools. The printed parts are immediately available. Parts that are no longer available can also be printed. People who do not have a 3D printer can still use iglidur I3. 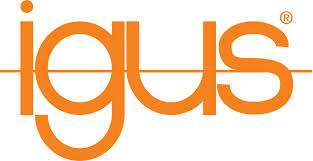 For these cases, igus offers a 3D printing service. Customers get their components printed and delivered in 1-3 days. CAD models are required for the print service.